Brother welcomes you at booth A6-C10 at FESPA Global Print Expo. Along with the award winning GTX and the GT-3 Series, Brother will present several hardware and software solutions to increase your productivity. 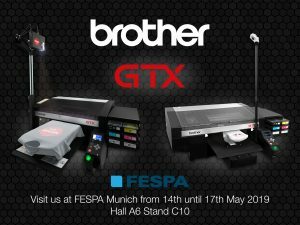 Brother welcomes you at FESPA. Take a closer look at automated pretreatment solutions, production tools for precise printing and several software solutions for automated processes. For the first time ever Brother will demonstrate the possibilities of printing on dark and coloured 100% polyester garments with the GTX printer by using the Brother made eco-friendly waterbased inks. Each day, there will be small presentations in line with the Brother Academy Concept. Several specialists from market leading companies give you an exclusive overview about different DTG topics varying from how to start a successful business and finding the perfect garment quality to useful tips and tricks through the whole printing process and he different drying methods. Do not miss the opportunity of meeting so many experts on one booth. Visit the website for further details, the timetable and the possibility to register online for a lecture. Of course, feel free to join even if you do not register in advance!